Many medicinal herbs can play a significant role in combating fatigue, both mental or physical. 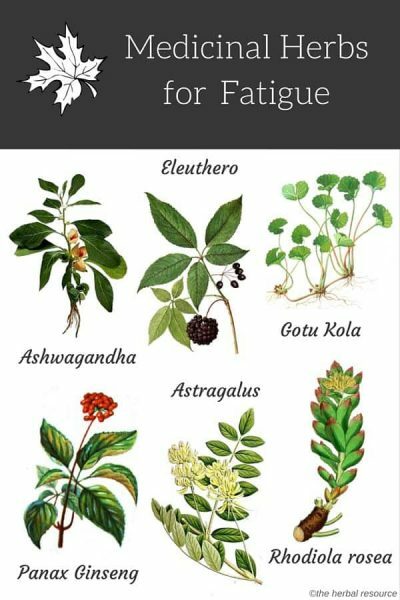 Herbs for fatigue treatment are usually adaptogenic, meaning that they balance metabolism. Adaptogens, as these herbs are called, can regulate the cardiovascular and the endocrine system and enhance the immune system. Although conventional medicine can address specific fatigue symptoms, adaptogenic herbs can provide a better overall balance to the hormonal system. Also for people with either too low or too high cortisol levels, using herbs can be helpful to keep these levels at their optimum. Herbs are ideal for treating fatigue as they can set metabolic processes at the optimal levels and enhance the immune system by increasing resistance to negative influences. Fatigue is a sensation of being tired and weak. It can be subjective and its onset is usually gradual. Chronic fatigue is fatigue that has persisted for more than six months, and it is not one that can be relieved by rest. An underlying medical condition is often the cause of chronic fatigue. Fatigue is mostly attributed to dietary or lifestyle problems such as lack of sleep or an unhealthy diet but can also be caused by dysfunctional gallbladder, thyroid glands, liver or adrenal glands. Getting rid of fatigue is very critical to both mental and physical well being. It is always a good idea to read up on each herb intended for treatment and to consult a professional medical provider before consuming any medicinal herbs for fatigue. This is especially important for those who are on conventional medication, pregnant or suffering from other diseases. Ashwagandha (Withania somnifera) is regarded as one of the best medicinal herbs for mental or physical fatigue, and it is often prescribed for people that have been diagnosed with thyroid issues that cause adrenal fatigue. Ashwagandha improves insulin sensitivity and naturally balances hormones levels. It also increases the natural production of thyroxine which supports healthy thyroid function. Eleuthero (Eleutherococcus senticosus) also referred to as Siberia ginseng is believed to help the body to handle stress by supporting adrenal functions, reduce fatigue and balance hormonal levels. In Russia, it is used to increase vitality and longevity by supporting stamina and reducing general fatigue. The herb modulates stress response by supporting the body’s ability to produce brain chemicals that offset the effects of stress. This herb is often prescribed by herbalists for those who lack concentration or are low on energy. Ephedra (Ephedra sinica) is also known as ma huang is used in Chinese herbal medicine as a stimulant and decongestant and is thought to be one of the world’s oldest medicines. Ephedra is believed to increase energy levels as well as fight off fatigue. The herb can cause some severe side effects, so caution is advised. Asien ginseng (Panax ginseng) was first used by the Chinese to restore vital energy as well as support healthy functions in the body. Also known as “King of Adaptogens,” this medicinal herb can help improve physical and mental performance as well as heart health. It is often recommended when recovering from illnesses or feeling fatigued. Licorice root (Glycyrrhiza glabra) is often used to reduce appetite for sweets and coffee which may weaken the functions of the adrenal glands. This helps to fight off fatigue and restore proper function of the adrenal glands. In addition, licorice contains glycyrrhizin, a substance that enhances production of cortisol, resulting in increased energy. Gotu kola (Centella asiatica) is an indigenous herb to the Himalayas and widely used in Ayurvedic and Indian folk medicine. Gotu Kola has been shown to be effective in fighting off fatigue by boosting energy levels as well as stamina. Bladderwrack (Fucus vesiculosus) is a seaweed found on the coasts of the North Sea, the Atlantic, and Pacific Oceans. It was the first source of iodine, discovered in 1811. Iodine has been proven to treat thyroid issues. As a dysfunctional thyroid gland is often the cause of fatigue, bladderwrack may be useful in regulating the thyroid gland’s functioning. Ginkgo biloba is an extremely ancient plant that has been found in fossils dating back 270 million years. As an herbal medicine, it has been used in China to treat various health ailments for thousands of years. Studies have shown that ginkgo can be useful as a remedy for poor concentration and fatigue. In Germany, it is often prescribed as a treatment for improving oxygen utilization and reducing fatigue. Ginkgo biloba is believed to protect the brain and liver from free radicals. Fatigue increases susceptibility to free radicals which in turn damage proteins, cells, and DNA. The herb is also thought to counteract the effects of high levels of stress hormones, like cortisol and adrenaline. Astragalus (Astragalus membranaceus) is another herb that has a long use in Traditional Chinese medicine (TCM). It is typically used in conjunction with other medicinal herbs, especially rehmannia and eleuthero. Astragalus is used to enhance the function of the adrenal glands and as a general herbal tonic. It has been shown to lower fatigue in athletes. Also, the herb is thought to be helpful for inflammation, high blood pressures and regulate the body’s water balance. Astragalus is available in the form of capsules, tea or tincture. It should not be used with blood-thinning medicines or by those suffering from high fever. Originally from China, reishi (Ganoderma lingzhi) is a mushroom used to boost the immune system, reduce stress, and increase energy. It is considered an excellent general tonic that is specifically used to treat symptoms associated with chronic fatigue symptoms and to increase energy levels. It can be used as a tea instead of coffee, and it is also available as a tincture, syrup, or in tablet form. Stinging nettle (Urtica dioica) is packed with minerals and vitamins and offers similar energy-boosting effect as coffee, without the adverse side effects. Many herbalists recommend this herb for people that are feeling weak or under the weather as well as to address endocrine imbalances, such as an under-active thyroid or adrenal fatigue. Boiled water and dried nettle brewed overnight makes for a perfect infusion. Shilajit is an ancient organic plant material preserved in cracks and crevices of the Himalayan mountains. The original source of shilajit is believed to be the royal’s spurge (Euphorbia royleana). In Indian folk medicine, it is known as the “Destroyer of Weakness,” and it is widely used to combat fatigue. In the past, shilajit was used by the Himalayan mountain climbers to preserve energy at great heights, and it is still used to this day by local Sherpas to oxygenate at high altitudes. One way shilajit helps provide energy is by increasing the function of mitochondria within the body cells. Mitochondria are the cells’ “power engines” as they convert oxygen and nutrients into ATP (adenosine triphosphate), the real source of power all cells need to function. As shilajit aids in the production of ATP resulting in increases energy and stamina, it is commonly used today to enhance athletic performance and treat chronic fatigue syndrome. Ginger (Zingiber officinale) has been used as a remedy for a variety of ailments for a long time due to its many medicinal properties. Ginger is often used with other adaptogen herbs such as ginkgo and ginseng to combat adrenal fatigue. Together these herbs are believed to have a strengthening effect on the adrenals, increase resistance to stress, and regulate the levels of cortisol. Often used as an herbal treatment for sleep disorders, St. John’s wort (Hypericum perforatum) can treat symptoms associated with fatigue such as insomnia and depression. It can also be combined with other medicinal herbs to relieve stress-related fatigue. St. John’s Wort is available in capsule, powder, or as an extract. Even though most people think of the dandelion as a weed, not many are knowledgeable about its health benefits. Cordyceps (Cordyceps sinensis, Sphaeria sinensis) are used in Chinese herbal medicine due to their ability to increase athletic performance, getting rid of muscle weakness, and to combat fatigue. Furthermore, Cordyceps has been shown to have immune-enhancing properties. Also known as golden root or Arctic root, this adaptogenic herb is often used to relieve stress-related physical and mental fatigue. Rhodiola contains salidroside, phytochemicals known to relieve anxiety and the herb has been shown to inhibit excessive release of stress hormones, particularly cortisol, leading to less fatigue. Also, rhodiola (Rhodiola rosea) increases the use of oxygen, improves cognitive functioning, and protects the heart. Holy basil (Ocimum tenuiflorum) also called tulsi is known in India as an elixir of anti-aging. It is regarded to have numerous health benefits such as regulating hormone levels, blood sugar, and blood pressure. Being an adaptogenic powerhouse, holy basil is an herb thought to be able to ease stress by calming the nervous system. Furthermore, the herb has been shown to have a positive effect on hypoglycemia as well as reduce cholesterol levels in the body. Moringa (Ocimum tenuiflorum) is a medicinal herb that contains a lot of antioxidants, fibers, and proteins. It is also shown to lower blood pressure, aid in adrenal functioning, and supply sustainable energy. Sumac (Hebanthe eriantha) also referred to as Brazilian ginseng is a medicinal herb found in the Amazon. Its benefits are regarded to be similar to panax ginseng, and it has been used traditionally by the indigenous population of the Amazon forest for centuries as a herbal remedy for a plethora of ailments, a panacea of sorts. The herbs are believed to be an immune booster, vitality and energy tonic, anti-inflammatory and appetite stimulant. Gynostemma (Gynostemma pentaphyllum), also known as jiaogulan, is a plant native to south China, northern Vietnam, southern Korea, and Japan. In China, it is a popular herb used mainly in tea form, often as a substitute for coffee and caffeinated teas. Gynostemma has similar medicinal properties to ginseng, and it is an important herb in Traditional Chinese Medicine where it is mostly used for its energizing and anti-fatigue effects. The herb contains a variety of unique phytochemicals that are believed to have antioxidant, anti-inflammatory, anti-hypertensive and anti-tumor activities.